Eighth place (142,54): this is our final result after a perfect free dance. 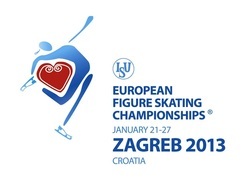 Four places better than European Championship 2012. Thanks to our coaches and to all our fans. With 56.54 we did our Personal Best in Short Dance and we are currently in 9th Place! Tanja and I are are so happy about our performance, we had so much fun skating and we would like to thank all the people supporting us!!!! Now we will have a day off with official practice and looking forward to Friday with our starting number 11! The audience was awesome in Hamburg, they supported us so well and this really helped us a lot. We’re really happy with our performance for know and we will work with more enthusiasm and energy to improve our skating skills and let the programs flow always better for the next competitions. Today was a really long day...we woke up around 6.30 due to the early practice. After the 25 minutes on the ice we did finally breakfast and then back to sleep!! Training started really early, first group was around 6, we skated at 6.50 for 20 minutes practice. on so they must wake up even earlier! We're back again on the way to Zagreb. Here we are, finally again in competition after a long and difficult beginning of the season. The long story in short is that Tanja broke his foot at the beginning of September and so we couldn’t skate until the beginning of November. But after all we managed to train as hard as we could to straighten things out and we have to thank our coaches Mrs. Barbara Fusar Poli, Mr. Martin Skotnizky and Mr.Renè Lohse.